Many homes around the country are filled with a wide variety of bacteria-killing products. From antibiotic medications to commercial household sprays, it’s clear that we’re all trying to avoid coming into contact with these disease-carrying microorganisms as much as possible. If you’re ready to ditch the commercial products and switch to natural, plant-based solutions for your bacteria-fighting needs, essential oils are the way to go. 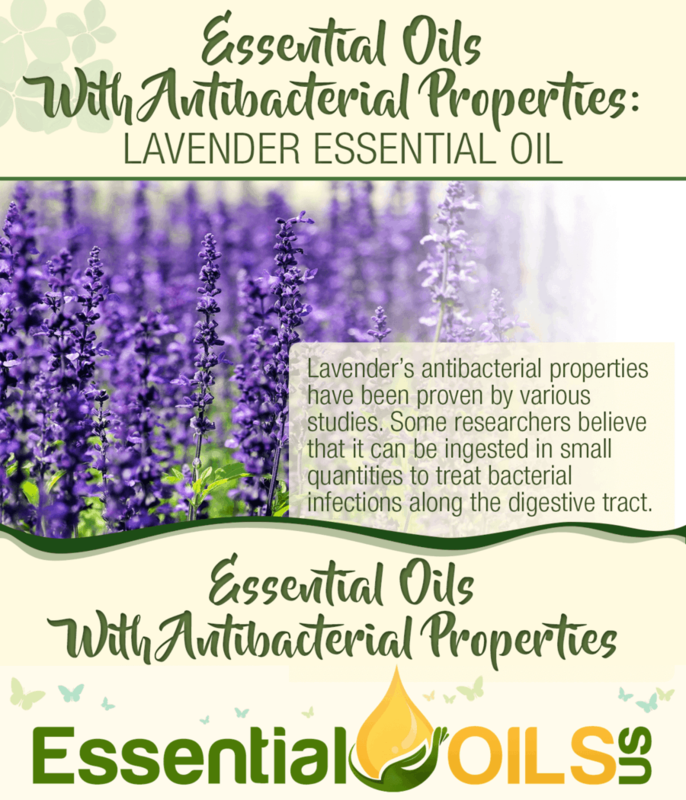 So many of our favorite essential oils have proven antibacterial properties that are just as powerful as those household cleaners and topical creams that we find ourselves so dependent on. These essential oils are safe, effective and relatively affordable alternatives to countless products that we may find in our homes. Many antibacterial products that are on the market contain harsh chemicals that can damage the body. For instance, many people use household sprays to clean their kitchens and bathrooms. Often, these sprays contain toxic chemicals that can harm the body if inhaled for long periods of time. Additionally, more and more studies are demonstrating the dangerous effects of bacteria resistance caused by the overuse of antibiotic drugs. Therefore, it’s wise to begin exploring more natural approaches to treating bacterial issues that relate to the body (source). 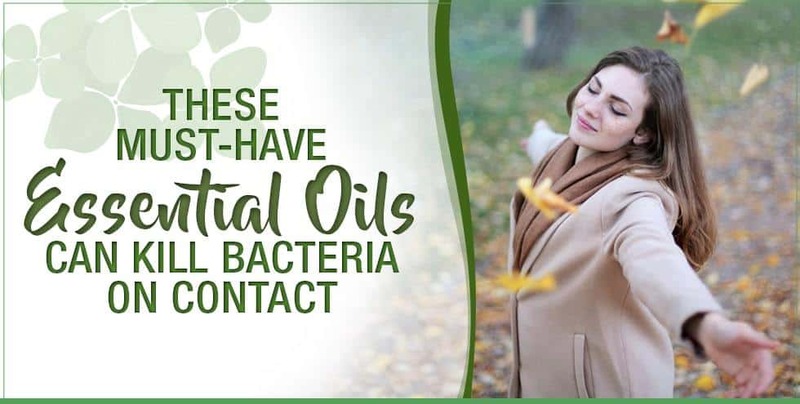 Besides the fact that these essential oils can kill bacteria, they also boast a wide range of health benefits that can improve your life in many ways. Many of the essential oils listed below also contain properties that fight inflammation, improve the mood and treat all kinds of pain. 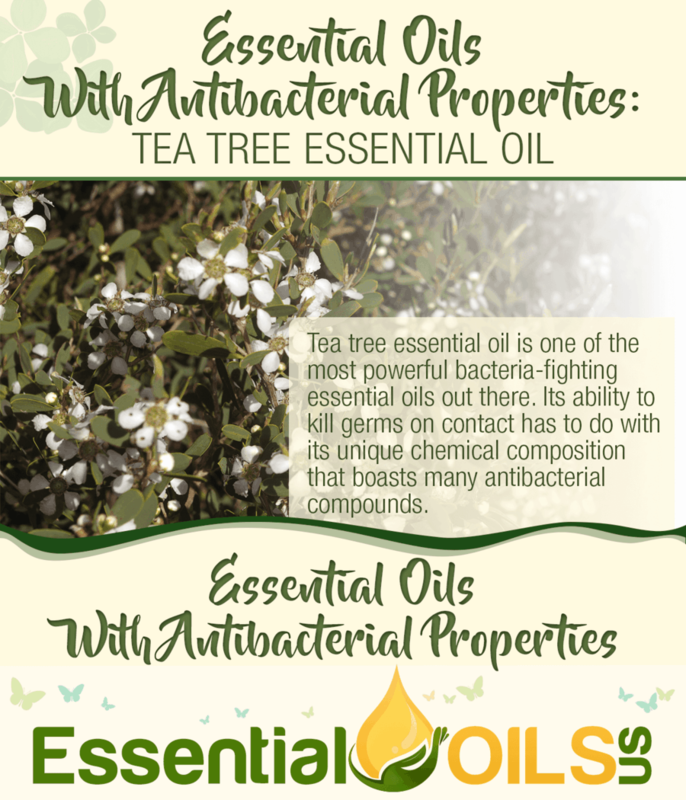 Tea tree essential oil is one of the most powerful bacteria-fighting essential oils out there. Its ability to kill germs on contact has to do with its unique chemical composition that boasts many antibacterial compounds. One study found that tea tree essential oil can kill dangerous microorganisms such as E. coli and salmonella. This means that tea tree oil can act as an excellent household spray for your kitchen counters. Tea tree essential oil is also commonly used to treat wounds because of its ability to fight infections. Just one drop of tea tree oil diluted in a carrier oil can prevent bacteria from infecting open skin. Additionally, tea tree oil is often used to treat topical bacterial infections such as staph. Many people who suffer from acne swear by tea tree essential oil’s ability to kill pimples quickly and effectively. Because pimples are just pores that have become infected, tea tree’s antibacterial properties can heal the skin in no time. Grapefruit essential oil is an excellent antibacterial product that has been proven to kill an enormous range of bacterial strains. 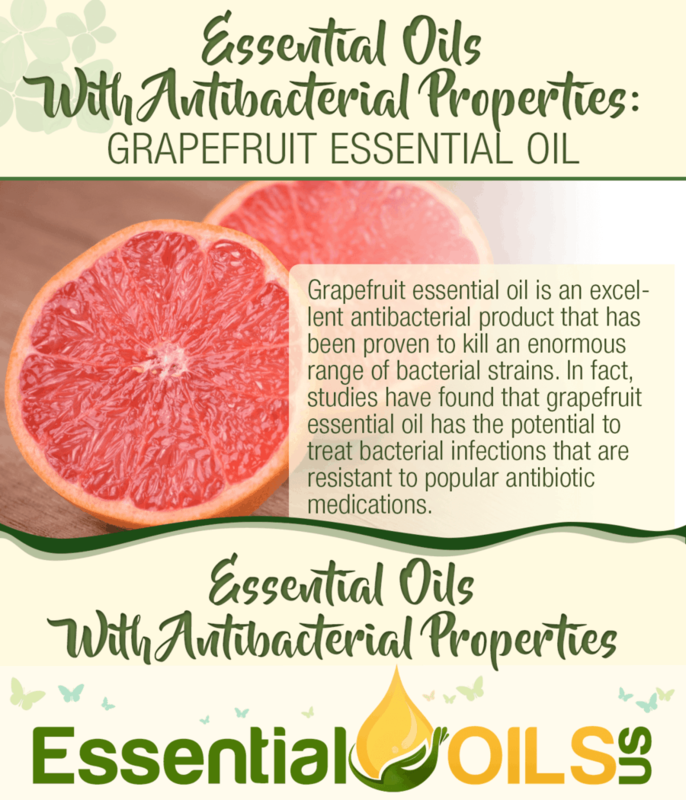 In fact, studies have found that grapefruit essential oil has the potential to treat bacterial infections that are resistant to popular antibiotic medications. One of the things that makes grapefruit essential oil unique is that it’s much safer to ingest than many other essential oils. Therefore, if you have an internal bacterial infection, you can pour a couple of drops of grapefruit essential oil into a glass of water and drink this tonic daily until the infection has subsided. 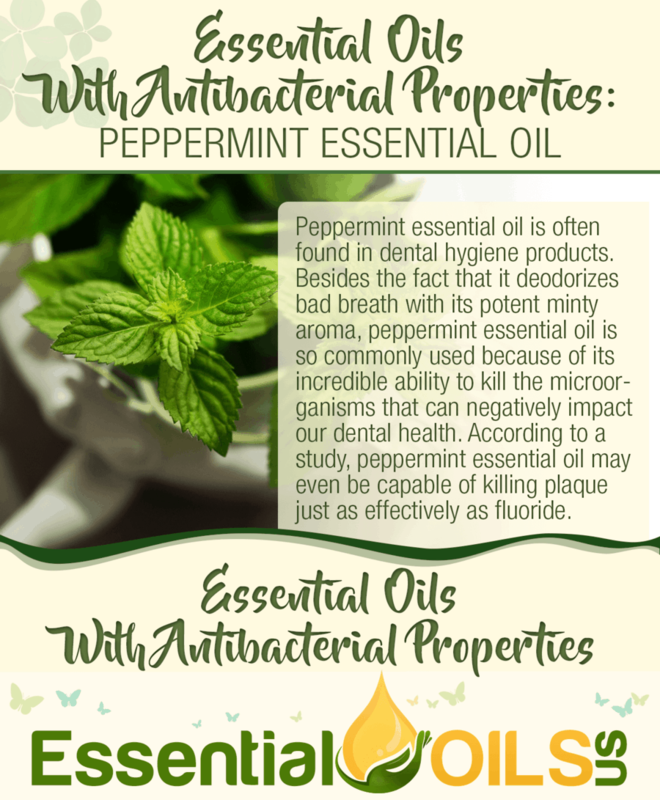 Peppermint essential oil is often found in dental hygiene products. Besides the fact that it deodorizes bad breath with its potent minty aroma, peppermint essential oil is so commonly used because of its incredible ability to kill the microorganisms that can negatively impact our dental health. According to a study, peppermint essential oil may even be capable of killing plaque just as effectively as fluoride. Thanks to its potent antibacterial properties, peppermint essential oil is often used as a spot treatment for acne. Many people find that a single drop of peppermint oil diluted in a carrier oil can kill a pimple overnight. Peppermint essential oil is also safe to ingest in small quantities, making it a natural tonic for various bacterial infections that exist within the body. It’s important to dilute peppermint oil in a liquid before consuming it because of the oil’s potency. Lavender’s antibacterial properties have been proven by various studies. Some researchers believe that it can be ingested in small quantities to treat bacterial infections along the digestive tract. Additionally, lavender essential oil is often used to clean wounds because of its ability to prevent infections caused by bacteria. This safe, gentle antiseptic product can prevent dangerous microorganisms from entering the bloodstream through the broken skin (source). 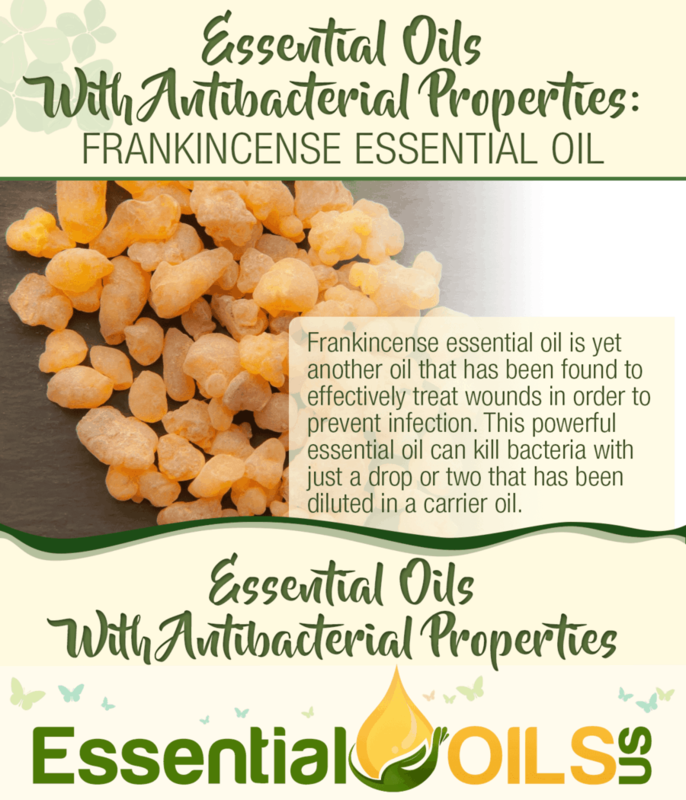 Frankincense essential oil is yet another oil that has been found to effectively treat wounds in order to prevent infection. 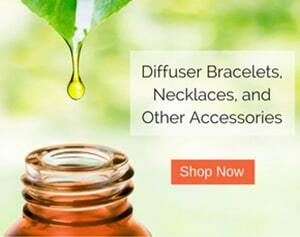 This powerful essential oil can kill bacteria with just a drop or two that has been diluted in a carrier oil. Spicy, invigorating clove essential oil has been found to treat bacterial infections of the respiratory system. In one study, mice were given small doses of clove essential oil in order to demonstrate the oil’s effect on pneumonia. 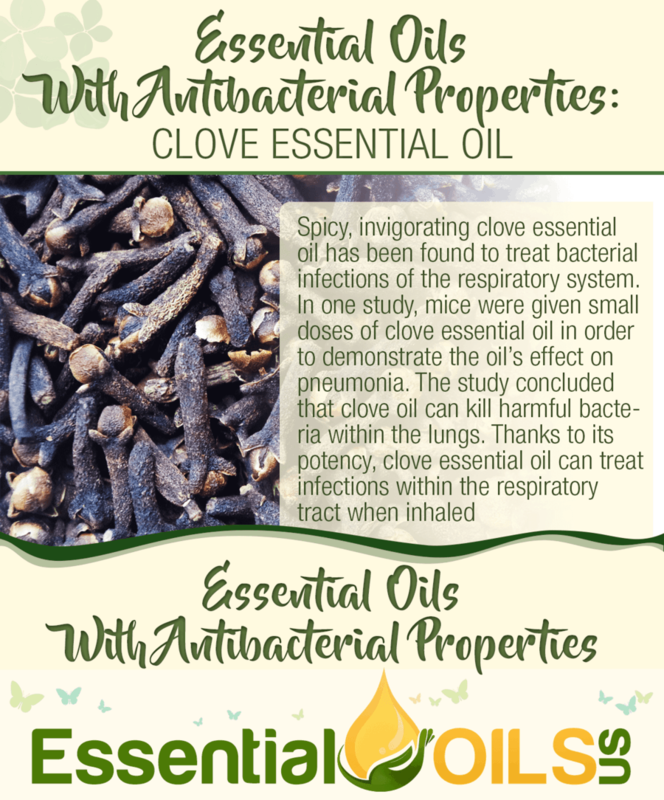 The study concluded that clove oil can kill harmful bacteria within the lungs. Thanks to its potency, clove essential oil can treat infections within the respiratory tract when inhaled directly (source). Clove essential oil has also been found to boast the ability to kill the bacteria that causes acne. Therefore, applying diluted clove essential oil to the skin may be able to combat breakouts (source). 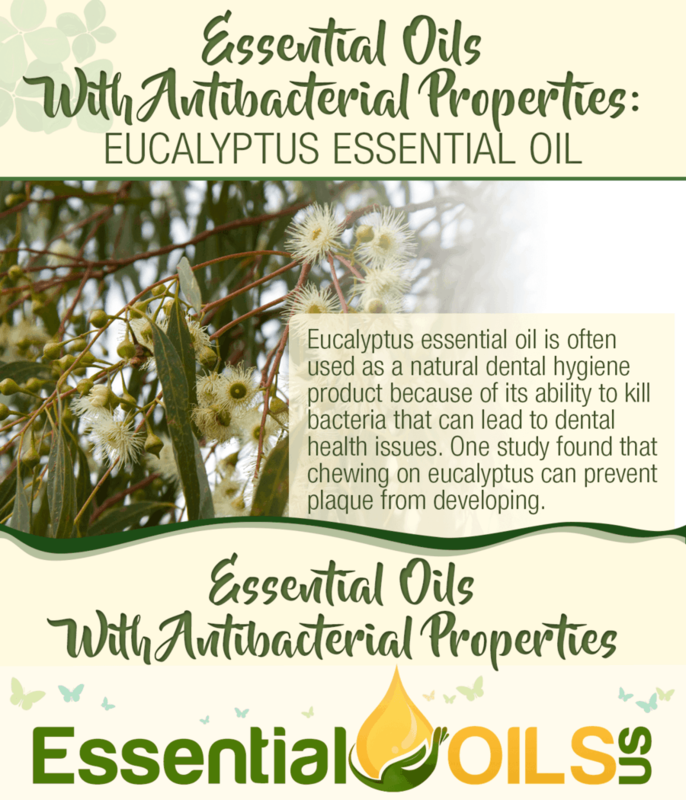 Eucalyptus essential oil is often used as a natural dental hygiene product because of its ability to kill bacteria that can lead to dental health issues. One study found that chewing on eucalyptus can prevent plaque from developing (source). Eucalyptus essential oil is often used to treat bacterial infections that exist along the respiratory tract. When inhaled, its bacteria-fighting properties can absorb into the tissue of the respiratory tract, killing harmful bacteria quickly and effectively. Additionally, eucalyptus essential oil has been found to kill many household germs that can cause illnesses. Therefore, you can make a homemade cleaning spray with this oil and use it liberally throughout your home. Fascinatingly, cinnamon oil is often used as a preservative in food products because of its ability to prevent bacteria from spoiling the food. 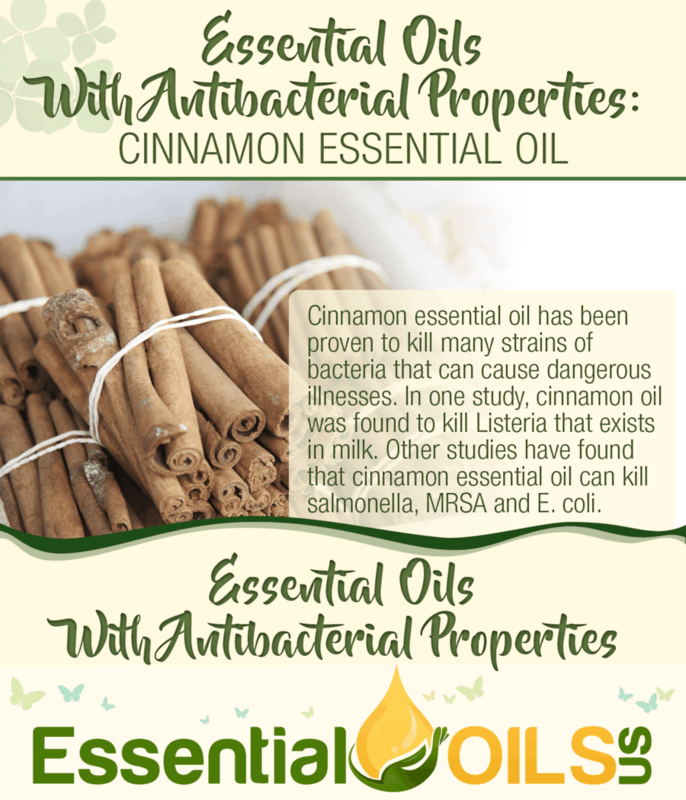 Researchers have found that cinnamon essential oil’s antibacterial properties are more potent than many other popular essential oils. In other words, a little goes a very long way (source). 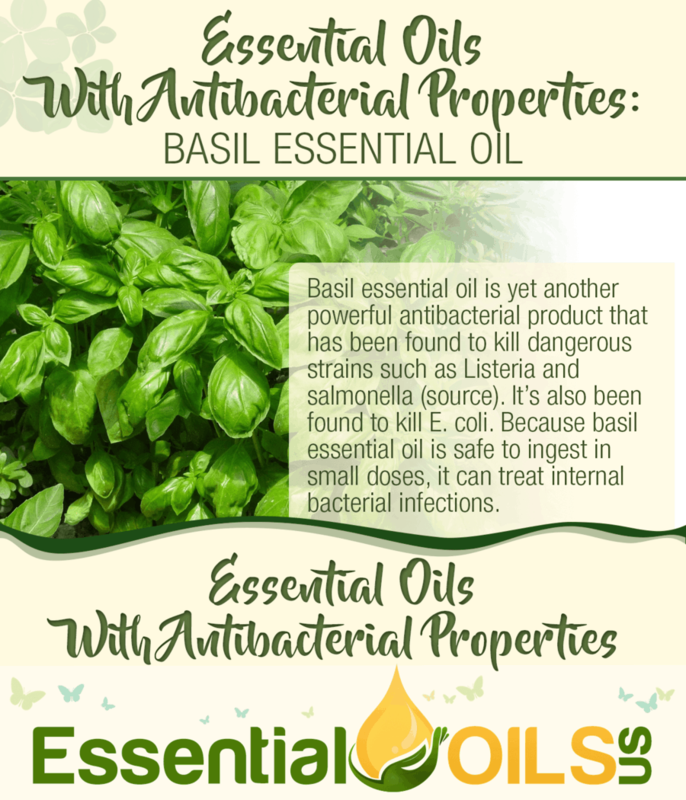 Basil essential oil is yet another powerful antibacterial product that has been found to kill dangerous strains such as Listeria and salmonella (source). It’s also been found to kill E. coli. Because basil essential oil is safe to ingest in small doses, it can treat internal bacterial infections. Plus, you can spray your kitchen counters with a solution of basil essential oil and white vinegar in order to kill germs that accumulate on surfaces (source). 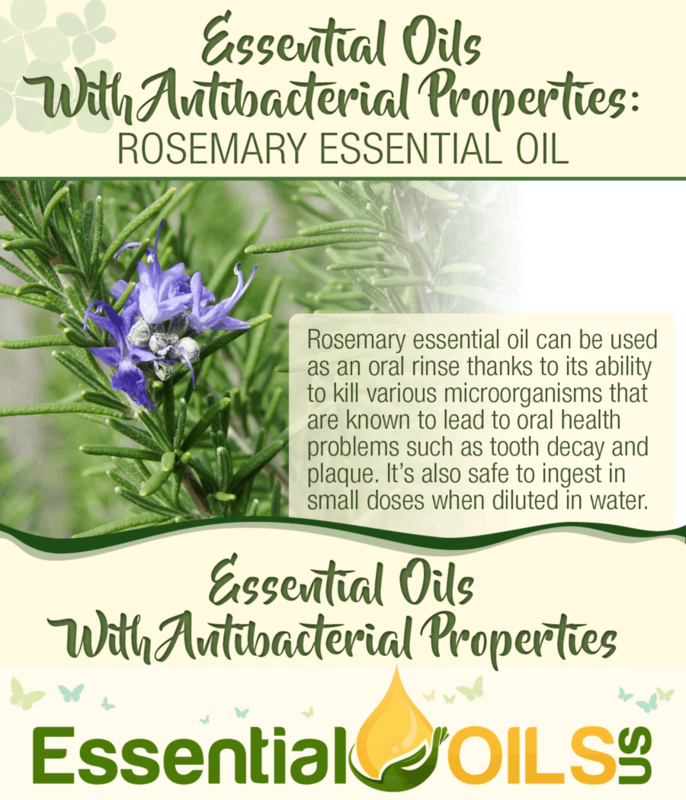 Rosemary essential oil can be used as an oral rinse thanks to its ability to kill various microorganisms that are known to lead to oral health problems such as tooth decay and plaque. It’s also safe to ingest in small doses when diluted in water. Plus, rosemary essential oil may be capable of treating bacterial infections along the respiratory tract when inhaled. Because of its powerful antibacterial chemical compounds, it can reach the infected tissue quickly. Rosemary essential oil is also found in many skincare products because of its ability to kill the bacteria that causes acne. 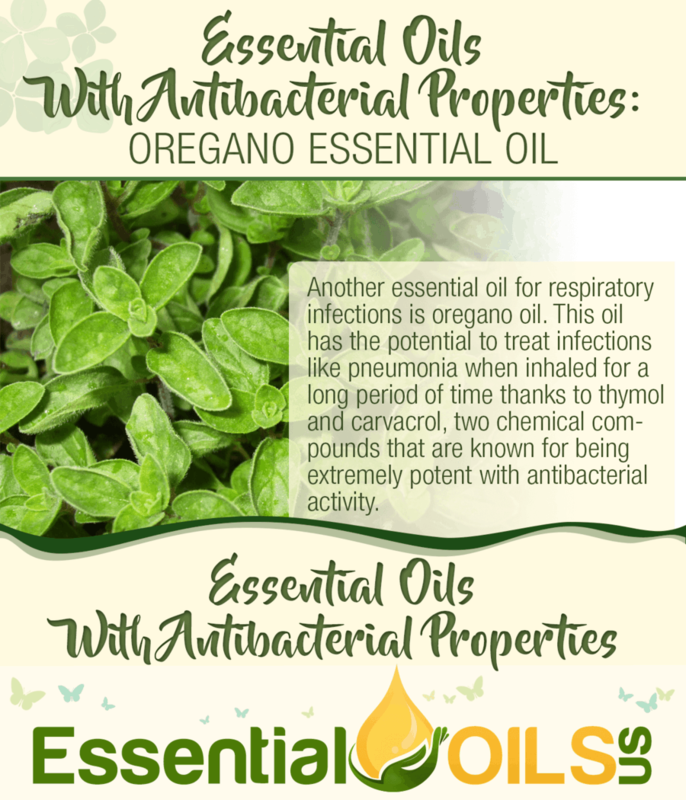 Another essential oil for respiratory infections is oregano oil. This oil has the potential to treat infections like pneumonia when inhaled for a long period of time thanks to thymol and carvacrol, two chemical compounds that are known for being extremely potent with antibacterial activity. Lemon essential oil is often found in household cleaning products because of its fresh, invigorating aroma. However, it’s also used in these products because of its unique ability to disinfect surfaces (source). 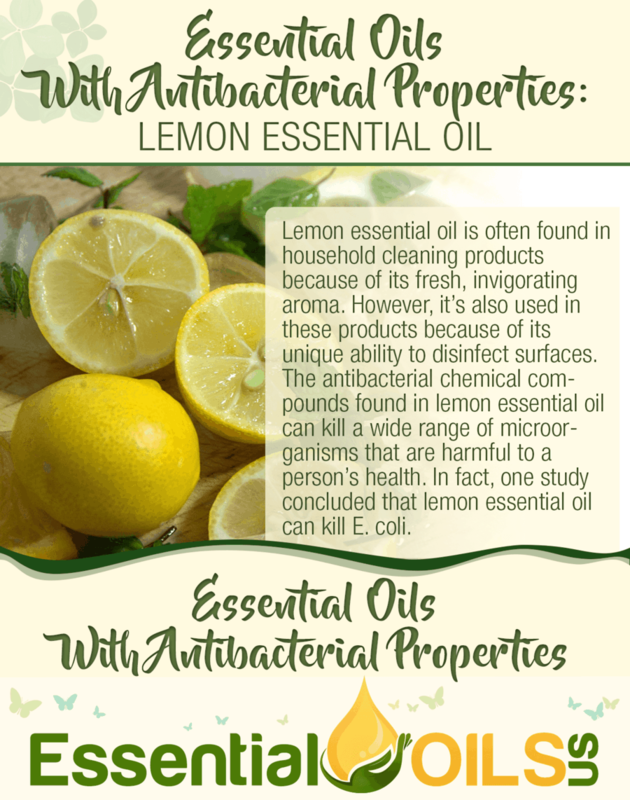 The antibacterial chemical compounds found in lemon essential oil can kill a wide range of microorganisms that are harmful to a person’s health. In fact, one study concluded that lemon essential oil can kill E. coli (source). Lemon essential oil can be safely ingested in small qualities when diluted with water. Therefore, you can consume this tonic to treat a bacterial infection within the body. Additionally, lemon essential oil is capable of killing the bacteria that causes acne when applied to the skin (source). All of the essential oils listed above have been proven to kill bacteria effectively and without the dangerous side effects for which many popular germ-fighting products are known. Plus, all of these essential oils smell absolutely incredible. Therefore, you’ll be able to enjoy their intoxicating aromas while using them for bacteria-fighting purposes. Do you use essential oils to kill bacteria? Let us know which bacteria-fighting essential oil is your personal favorite in the comments section below.